When you are tired the colour drains from your face making you appear more sallow, grey with dark circles around your eyes. 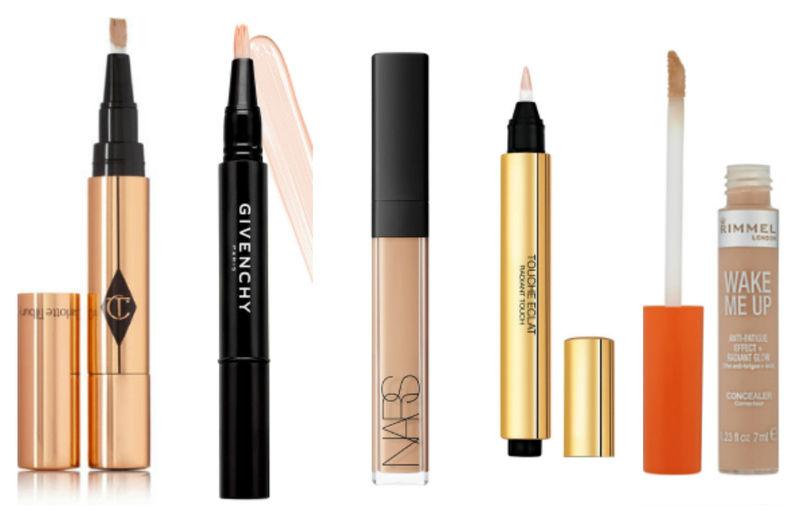 Here are my top five under eyes concealer that will give you instantly the wide awake look and will give you a younger and fresher appearance. When you are tired the colour drains from your face making you appear more sallow, grey with dark circles around your eyes. Using an under eyer brightener will give you instantly a wide awake look and a younger and fresher appearance. Always apply eye cream first and let it completely sink in to your skin. Follow with your foundation of your choice and the rest of your makeup and then apply the under eyes concealer as a finishing touch. This is my favorite under eye concealer at the moment - the coverage is excellent - it does an absolutely amazing job covering under-eye circles and just lightening up that whole area. This is god send for these days where you I don't get much sleep. Texture of the concealer is quite thick but yet smooth. It blends well and doesn't settle into the small creases near my eyes. This concealer is thick but creamy and conceals and brightens the under eye area at the same time. Another bonus is that the pen lasts quite a long time as you only need a tiniest amount as its quite pigmented and if use to much of It can get a little cakey. The multi award-winning cult beauty classic loved by celebrities, supermodels and make-up artists everywhere is also one of my favorites highlighters and under eye brighteners.Many people confuse this one as concealer - which is clearly not - if you would apply it over a blemish it will only highlight the problem area. Also if you have very dark under eyes circles - you will need to use corrector and concealer first. It's very creamy and it doesn't accentuate my lines and it also works great as a highlighter.It dries quite fast so you have to blend the concealer in very quickly. I would suggest this concealer to anyone looking for something with high coverage that doesn't feel thick or heavy. if you are no tight on a budget than I highly recommend the Rimmel Wake me up Concealer. This one is almost idenitical to the NARS Radiant Concealer. This concealer covers my dark circles perfectly and really gives me wide awake look. And again if you have very dark under eyes circles - you will need to use corrector and concealer first as it won't cover these. I generally don't use powder as I don't like it the powdery look - it just emphasizes my lines but If your under eye area gets very greasy you should set your concealer with a light dusting of powder. I like the to use the Laura Mercier Secret Brightening Powder for under eyes with a Smashbox Fan brush.